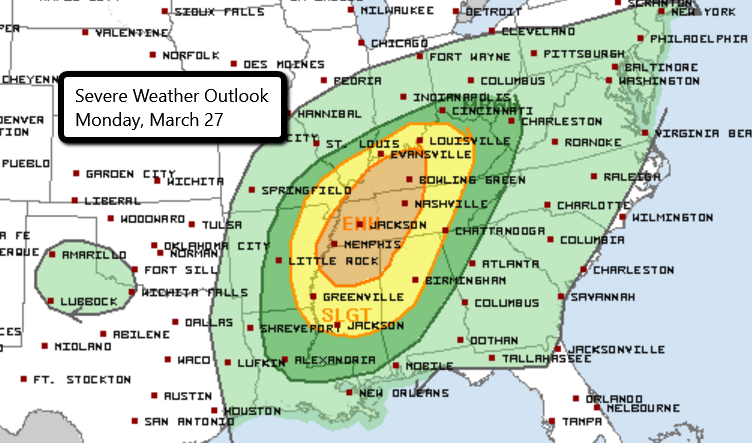 There is an Enhanced Risk of severe weather today in parts of Mississippi, Alabama, Tennessee, and Kentucky. This includes Nashville and Memphis in Tennessee and Bowling Green in Kentucky. Storms will develop later today and continue into this evening. Large hail, strong winds, and a few tornadoes will be possible. Tomorrow also features an Enhanced Risk of severe weather. The strongest storms will be focused over Oklahoma and Texas. Watch chasers LIVE in the field here.